The stone age is full of mystery, which, in fact, does not mean it had not developed a certain type of social relations and attitudes of ancient people towards each other and environment. After some time, already in the glacial period, Neanderthals originated in Europe - people who used more "advanced" tools than their ancestors. The food was harvested as before - with the help of hunting, only now they were hunted in groups, and not alone. Neanderthals were replaced by the Cro-Magnon people, whose development went even further. They began to invent new tools of labour and hunting: stone knives, harpoons, scrapers, tips for spears. About 6000 years ago, the life of ancient people underwent a new, more steep turn, which dramatically changed their entire life. Ancient people began to grow grain. With this invention, a new stone age, the Neolithic Age, arrived. 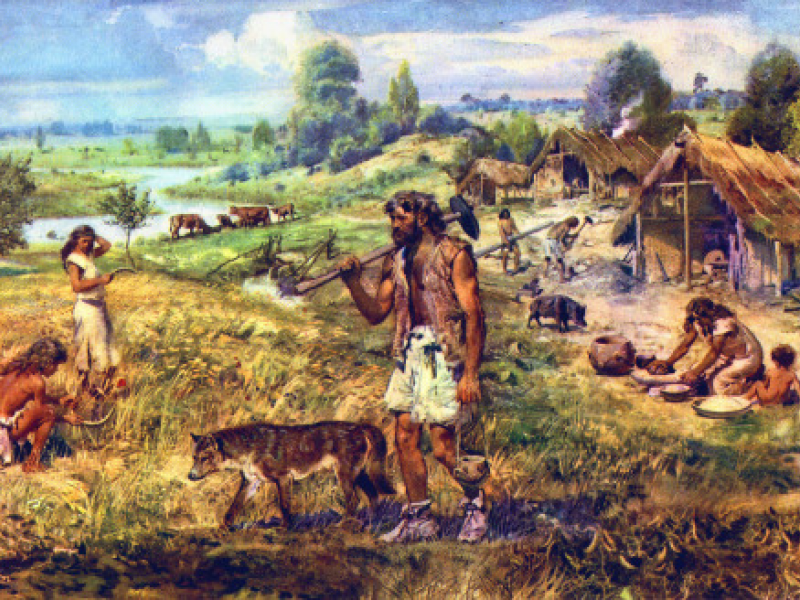 Man learned to breed animals, use their skins as clothing, the first building of houses began. Later, the man began to create objects and things that do not exist in nature. Then went modelling of dishes from clay, the spinning of flax and wool. People began to work together, and little by little the first settlements began to appear, from which later cities and villages occurred. So that what is now called civilization is born. When it comes to specific features, there are many aspects to touch upon, but this article also aims to demonstrate how the environment during that time impacted people and their way of life in a nutshell. The first thing to mention is the origins of culture. The emergence of culture as a specific branch of activity was closely related to the development of thinking and self-awareness of inhabitants back then. Therefore, we can confidently associate it only with a reasonable individual. The burials of the Neanderthals and the rudiments of art suggest that the Neanderthal man was already capable of thinking abstractly, thus possessing individual and social self-awareness. Burial of the deceased was accompanied by a special rite: the body was buried in specially dug pits in the sleeping man's posture, whereas stone tools, meat, wildflowers fell into the grave. All this could be evidence that the Neanderthal person attached particular importance to life and death and, perhaps, thought about the afterlife. There were Neanderthals other rituals performed, including hunting. So, in many caves, it was found neatly folded skulls of bears and other animals used for ritual purposes. At the same time, art began to emerge in the form of bone amulets, schematic drawings. The emergence of art and religion deserves a special attention too. However, the real flowering of prehistoric art reaches with the appearance of modern man. The range of works was substantially wide: engravings of animals and people, clay and bone sculptures and reliefs, drawings of ocher and charcoal. When depicting animals, ancient masters achieved amazing realism. At the same time, there was a schematization of the figures, up to the transformation into symbols. Another interesting feature to bring up is the complicated funeral rites of people of the Upper Paleolithic. The dead were often covered with red ocher symbolizing blood and life, individual burials were accompanied by rich ornaments in the form of beads. There were also tools, weapons, ritual food placed in the grave. Last but not least, the era of modern man as the time of development of language, rational knowledge, and religion had an immense impact. That was marked by the emergence of generalized concepts, which was quite imperative for the accumulation and exchange of information: gradually accumulated knowledge of geography, zoology, medicine. The early forms of religion were pervading as well, including magic, animism, totemism, fetishism. With the transition to a productive economy, the accumulation of positive knowledge, the circle of man's culture expanded. Agriculture stimulated the growth of knowledge in agrotechnics and botany, cattle breeding - in selection and zoology. The requirements of production led to the emergence of mathematical knowledge and counting systems. The pictograph was getting spread - a drawing letter. With the arts continuing the transition to the convention and symbolization of the image, it led to the emergence of an ornament. The era of bronze could be regarded as the time of the disintegration of egalitarian society, and as a decisive moment for the formation of religion with special clergymen-priests. The transition to a patriarchal society and tribal organization led to the emergence of cults of the patron saint of the tribe, the ancestors and spirits of their ancestors. At the same time, there were cults of patrons of agriculture and cattle breeding, who acquired images of gods. The development of craft stimulated the growth of applied art - jewellery, carpet weaving, pottery. There were artistic work, engraving, inlay with precious stones. The apogee of the spiritual development of prehistoric society was the invention of writing. This happened by gradually transforming the pictographic letter into hieroglyphic, and then into the alphabetic one. With the advent of writing in Sumer, Egypt, China, and then in other countries, the era of prehistory came to an end.